Full Screen Viewing: Now you can take advantage of the full size of your monitor when you are reviewing images on the site. Just click the “Full Screen” button in the tool bar of the viewer. Since you can’t enter text while in full screen view (this is a security feature of the Flash player) you can’t annotate, or add other things to the image in full screen, but you’ll get a great view of the document. 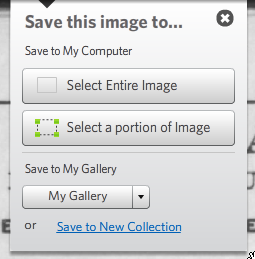 We’ve also added the ability to select a specific part of an image to save or print so that you can get just the parts you want. On the search results page you’ll find a “report an error” link below the information about each image. When you come across a mistake in the indexing, just click the link, tell us where the error is and what it should be and we’ll see what we can do to get it fixed. We’re still working on our new search and we really appreciate the feedback we’ve received so far. We just added categories to the Advanced Search page, and we’ll soon add the ability to search within a date range. We removed a few steps from the process of uploading an image to add it to a Story Page or connect it to another image you find. We hope that these changes and others we are working on will make Footnote a better place to find, use and share the images and stories that are important to you. Please let us know if there are things you’d like to see on the site. When I have tried to print different documents they all print in total black, no text, no picture, just all my black ink!!! What is wrong? So then I tried to save the image to my computer to print from there but they usually download as a thumbnail as jpg or bitmap. I am desperate to print a document in which my dad,Frank L. Follansbee, a WWII veteran, was a witness in a Missing crew plane crash. I am going to visit dad this Memorial Weekend & I want to bring this document to him. He is 90 years old (& doing great!) & was a pilot in the Army Air Force WWII. I would like to surprise him with this document, actually it’s 10 pages long! HELP PLEASE!